It started inauspiciously enough. I knitted a few balls out of leftover black, white and gray yarn. Little, round, baseball sized orbs that quickly became dog and cat toys. 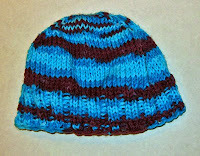 I knitted more, up to softball size, some with color changes of black to gray to white. I decided they were Zen balls, good for squishing while attempting to meditate on life, and gave them away, mostly for people to throw at each other in a very un-zen like manner. I’d post a picture, but unfortunately, the only one I retained is thoroughly covered in dog slobber, and is not a very appetizing sight. Then came the goldfish. 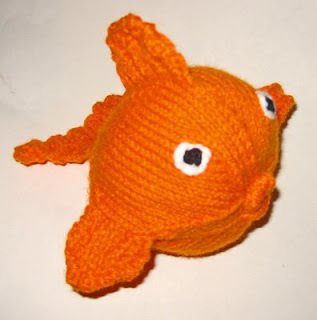 Innocently enough, I spotted the pattern, and thought ‘Wow, I know a few pint-sized people who would like those.’ So I knitted orange goldfish and dropped them in the mail to swim their way around the country. 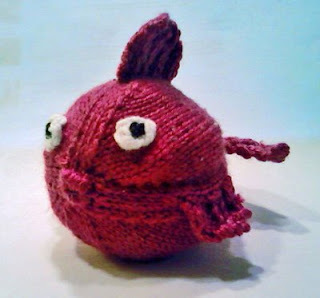 Apparently, knitting four goldfish didn’t get them out of my system, so I knitted two more, one in the last of the orange, and one in purple, because really, what small fry is going to complain if his goldfish isn’t regulation color? The more obnoxious the better, when it comes to kids and stuffed animals. 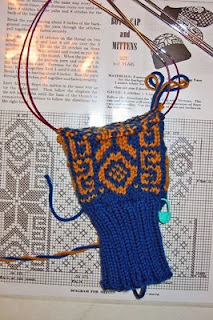 and now I’m working on a Norwegian mitten pattern. I’m sure there will be loads of other distractions to keep me from doing what I should be doing at the time. And for the record, yes, I wrote a poem today. A rather harsh poem about my intense dislike for telephones and their annoying rings, and how I should yank the darn thing right out of the wall, and just keep my cell, which I can put on silent and ignore if I wish. I know, I know, I could ignore the landline, I should ignore the landline, but I can’t ignore it … and that’s a whole 'nother fish story. I'll take a sister, big or little. Maybe I can trade my brother in! I smell something fishy,like a conspiracy. Just a warning sis,nonny is known to be a double agent. Heh Heh, we will leave him with a "knitted brow", worried that there may be a conspiracy ummmm, shall we say "afloat", and that his Nonny-Hari may turn on him in some covert way. 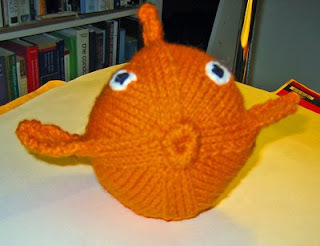 Can morse code be sent via clicking knitting needles??? 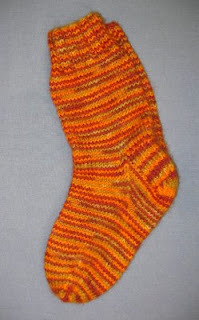 I like the Norwegian mitten pattern. I have something similar in cross-stitch (unfinished, since you ask) that claims to be an Icelandic pattern. Maybe Unn the Deep-Minded took it with her. I give thanks for the wonderful Thanksgiving dinner we just had. Roast Corgi with all the trimmings....slendid! That's quiet a hobby! And yes, writing is often not thought of as strenuous, but it truly is. You have a great site here! Lots of cool links for poets and writers. Do you ever blog your poetry? And if you wondered, I found your site through the verve network thingy. Gabriele, you're the fifth person to say that! Trying to math out some tropical fish now. Angelfish, and yes, maybe a Nemo. Anon, if you had corgi for dinner, you should be happy and bouncy! He's happy and bouncy alright, just like a recently burped baby... He waited for days for your reaction to his entry, just like an attentive Corgi keeping watch at the window for the food provider to return. Nonny - Methinks Anonymous needs a new hobby. I think SUNY has basketweaving, don't they?? And how come I haven't seen any Thanksgiving pics? Is his shiny new cell phone sans camera?? ?